What Day Of The Week Was March 21, 2018? 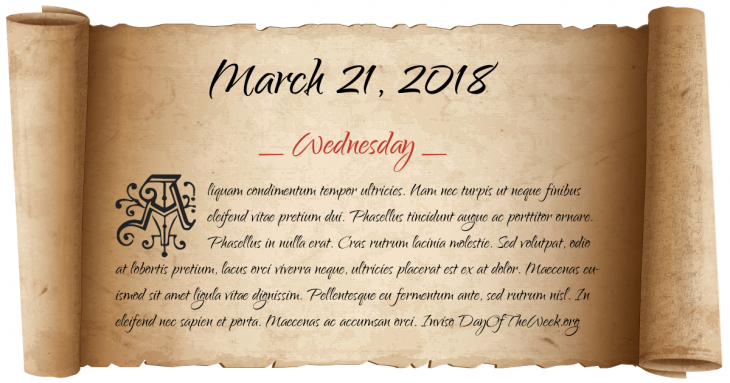 March 21, 2018 was the 80th day of the year 2018 in the Gregorian calendar. There were 285 days remaining until the end of the year. The day of the week was Wednesday. Here’s the March 2018 calendar. You can also browse the full year monthly 2018 calendar. Aries is the zodiac sign of a person born on this day. Aquamarine is the modern birthstone for this month. Jade is the mystical birthstone from Tibetan origin that dates back over a thousand years.